Product Description- Brunch date, dinner with friends or a pre-wedding facial? Everyuth Naturals Golden Glow Peel-Off Mask gives you a quick-fix in just 15 minutes! Golden minerals and nano peptides lock moisture, nourish and leave your skin with a fine golden hue. Dust, dirt and pollution clog skin pores and make the skin look dull and dark.new advanced Everyuth naturals golden glow peel-off mask is a home facial with nano gold peptide and minerals that works wonders on your skin. It peels away dead cells, dirt and bacteria from within the skin pores, stimulates blood circulation and oxygen supply. Its just 15 minutes, it gives you an instant fairness with a golden glow. 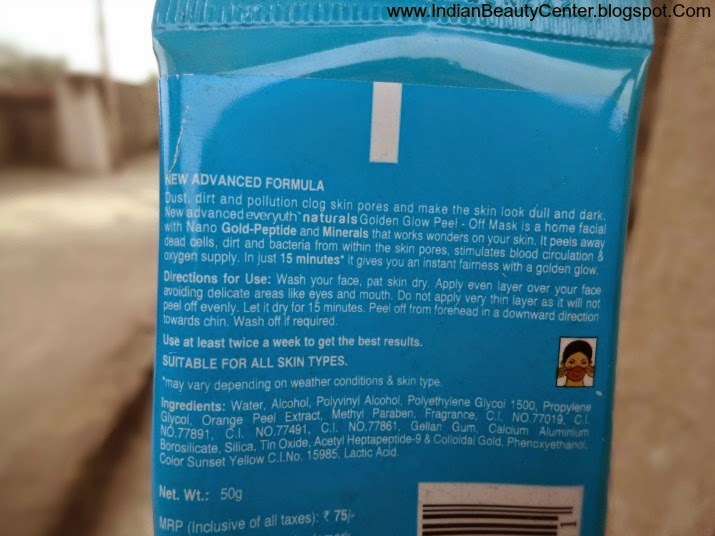 Directions for use- Wash your face, pat skin dry. Apply even layer over your face avoiding delicate areas like eyes and mouth. Do not apply very thin layer as it will not peel off evenly. Let it dry for 15 minutes. Peel off from forehead in a downward direction towards chin. Wash off if required. Use at least twice a week to get the best results. Ingredients- Water, Alcohol, Polyvinyl Alcohol, Polyethylene Glycol 1500, Propylene Glycol, Orange Peel Extract, Methyl Paraben, Fragrance, C.l. NO.77019, C.l. NO. 77891, C.l. NO. 77491, C.l. NO. 77861, Gellan Gel, Calcium Aluminium Borosilicate, Silica, Tin Oxide, Acetyl Heptapeptide-9 and colloidal Gold, Phenoxyethanol, Color Sunset Yellow C.l. NO. 15985, Lactic Acid. Everyuth has this catchy tagline that says- "born to play" and this peel off mask gives you an opportunity to do exactly that. It is a bit messy to apply, messy to get rid of from your hands and a bit thick and totally golden! 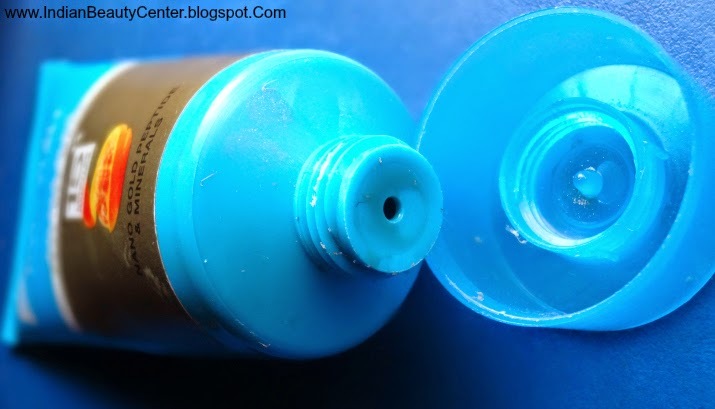 This comes in a lovely blue tube with a rotate-open cap and is thick in consistency. The tube is small, pretty and travel friendly. It is easy to squeeze out the product from the tube and the liquid peel off mask has millions of golden glitters. I was scared at first to try it because I did not want a glittery face. After it dries in 20 minutes, peeling it off is a challenge. Honestly, I have never managed to peel it off totally at once as they show it in the ads and I have to peel it off in bits. But anyways, it hurts only a little and I can manage to bear that light sensation. So, after removing this amazing mask, I see that my skin feels deeply purified, cleansed, bright, soft, supple, smooth and I am sure it pulls away all the dead skin cells from the skin's surface. So, I would say that this is a great option when you need that quick facial kind of look and you have no time to go for a full session. However, I would think twice about replacing facials with this. Also, some might be worried about the skin losing elasticity because of all the tugging and pulling this mask does. This peel off mask did not break me out or cause any trouble on my skin. I had used it in the past (the older version) and even then it worked fine! So, I would say that this face mask does make a difference and it does NOT leave any glittery particles on my skin, which I feel is super cool! So all in all, you must try this mask. I would definitely recommend this to all of you and would myself repurchase this for sure. 11) Leaves behind NO glitter particles on my skin. Yay! Heard good things about this product, loved your review Arpita.. Happy new year!! Wishing you all the best Arpita!